A Cuban classic that goes well with fried plantains. Rinse and drain rice. Add rice and all other ingredients to a saucepan and bring to a boil. When it reaches a boil, turn to a simmer and cover. Simmer rice for about 15 minutes and then remove from heat. 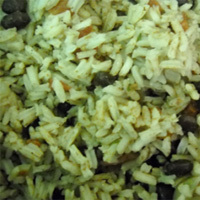 Let the rice rest for 10 to 15 minutes or longer before serving.